The Popup Dialogue-Centre “Durchblick” opens its doors for citizens in Cologne. It is dedicated to the questions and answers on the digitalisation of work. Which technologies will be pioneering in the future and which social and ecological aspects will play a role? What hopes and worries do we associate with digitalisation? In the travelling exhibition, which tours six German cities from October 2018 onward, we present current developments and trends in the world of work and invite you to join us: by participating, asking questions, expressing opinions and criticising – we want to hear your vision for the future or work! For six days, starting on 13 February 2019, the exhibition will be located at ecosign / Akademie für Gestaltung, Vogelsanger Str. 250, 50825 Köln, Germany. We look forward to your visit on business days between 10 – 5:30pm on weekdays. On 18 February, we invite you to a round table discussion on the topic “Who has the power – beautiful new work? Will digital work support or control people in the future?”. Discussing with us will be Bernd Draser, Marc Rexroth und Alice Berger – Moderation: Carolin Baedeker. 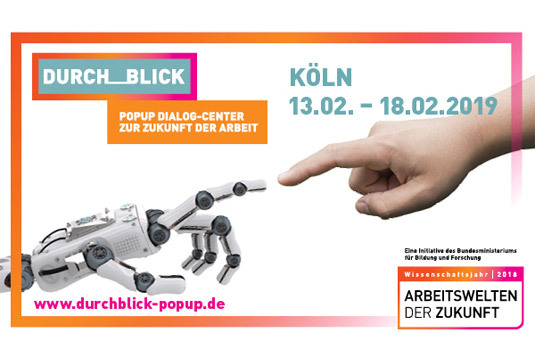 For more information, please visit our website: www.durchblick-popup.de and follow us on Twitter @durchblickpopup.